Hanano Puzzle is a freeware game for those who like to exercise their brain. A Japanese PC game of roses and cubes, it may seem odd at first but once the concept is clear, it’s time for some head scratching. To sum it up, the player has to join a colored cube with a flower of the same color to result in a beautiful rose. 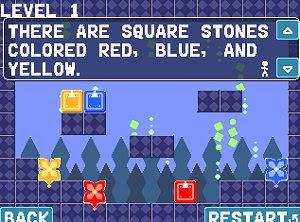 However, the cubes may only move one square at a time horizontally and are able to exchange places with the flowers. The trick is to find the correct order in which to join the cubes and flowers so that new pathways are created to reach the most improbable places. It may sound easy but will leave most players restarting a level over and over again, trying to discover the devious solutions.